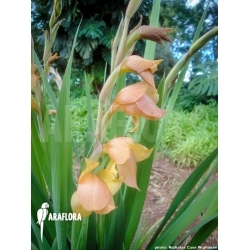 Gladiolus dalenii is one of the most widely distributed species of gladioli, ranging from eastern South Africa and Madagascar throughout tropical Africa and into western Arabia. This species is therefore also called Natal lily. It is one of the ancestors of the current large-flowered grandiflora hybrids that are cultivated as cut flowers. Gladiolus dalenii is the main parental species of the large flowering grandiflora hybrids, but that is about the cultivars and much less about the real species, because it is rare. The flowers are usually orange-yellow and smaller than with the cultivars. This species occurs naturally in open spaces and between rocks in grassland. It thrives on permeable soil and sun. In the spring, from the beginning of May, tubers can be planted in the garden. Put them in a warm and sheltered place and in permeable soil. The subtle flowers are very beautiful and that is why it is good to put them in a place where you can see them daily. In the autumn harvest the tubers and hibernate in a cool and frost-free place. Make sure that the tubers are not eaten by mice!